1. Combine the milk and butter in a pan and bring to the boil until the butter melts. 2. Take it off the stove. 3. Slowly add the flour and mix it with a wooden spoon or process in a food processor until smooth. 4. Slowly add in the eggs, one by one, stirring well with each one. 5. Heat the frying oil at about 180°c (356°f) and pipe churros mixture into the oil. 7. 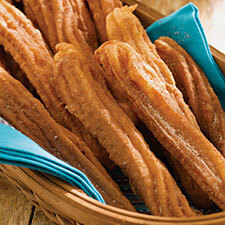 Dust sugar, cinnamon and/or icing sugar onto churros. Optional: Dip in chocolate or coffee if you don't want sugar/cinnamon/icing sugar. When I tried it, I put toooooooo much butter. It tastes nice with icing sugar and cinnamon. Hehe... Will you give some to Linda? It's actually 'sugee'. It's on my English book (Kogoro). Well..... my mother decided to never make it again. There were two recipe... one of them POOFed out on us, as in, didn't taste THAT nice. Mother said that next time if we want to eat, we buy it when we're in Westfields.